National Schools Rackets – almost done…. Writing this post is just extreme work avoidance…. I’m not even sure I will publish it but it sure beats marking my Y12 end of term Biology exams. Eton is down to just one competitor on this the penultimate day of all competitions. In the Foster Cup quarter-final Rory Giddins won 3-0 late last night after a busy day in Cambridge doing his university interviews. He now has a semifinal this evening against Nico Hughes, the Pauline who beat Hector Hardman in what was by all accounts an impressive and high quality match. Unfortunately I missed Hector’s match due to being stuck on the M4 taking some boys back to school. Hector has improved considerably this term and I have been more and more impressed with him. He is developing some power in his ground-strokes (due to improved foot-positioning and dare I say it, strength) and I think he can develop into a real challenger for this title next season. Lots of hard work ahead- in particular working on his aerobic fitness and endurance. Salil Navapurkar has played well in the Renny Cup and continues to look a real prospect. He has a brilliant match temperament and some powerful shots to boot and I hope he will challenge for a first pair position in the years ahead. Rackets is great for his tennis development as it promotes footwork, hand-eye skills and volleying. When you are used to hitting 130mph rackets balls, a well hit tennis shot still seems to afford lots of time…. Luke Pitman started his Renny match yesterday playing superbly but the consistency is not there just yet. Luke has made big strides in improving his game this term and I think he can get better and better. He will certainly be in the running for our Most Improved Player award next half if he keeps this progress up. 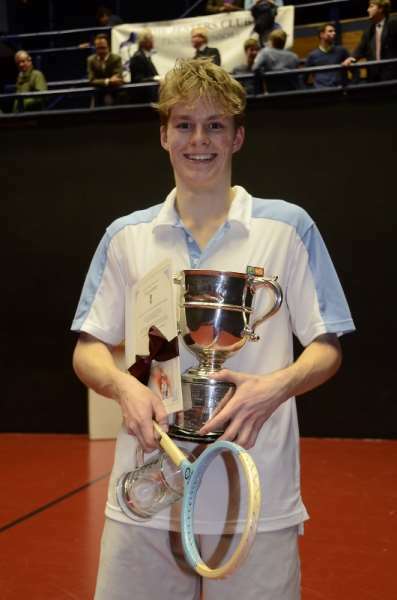 Another exciting tennis player, Louis Manson, has also had a good week in the Jim Dear. He has missed most of the term due to injury and so his preparations were restricted to just a week or so of play. He won the first game in his semifinal yesterday against Julian O’Riordan from Tonbridge, and indeed outplayed him in these early stages. Louis’ fitness was not quite up to scratch (understandable really after his long lay off) and gradually O’Riordan’s quality and class started to show. Louis needs to learn to control (indeed eliminate ideally) his outbursts on court. Nothing gives an opponent more self belief in what is a really challenging sport, to see the opponent screaming and shouting in disappointment. But Louis can take real confidence from getting so close to beating the eventual winner… Again fitness and mobility will be the two keep things for him to work on in 2016….. I hope Rory can keep Eton interest going into the Final day. Right time to head off for another M4 journey! Yesterday was a tough day overall for the Eton rackets team. In spite of two good wins in the Foster Cup for Rory Giddins and Hector Hardman, we are now down to our last six competitors. In the Jim Dear, Jamie Hardy and Louis Manson both have tough matches ahead this morning. Both boys have a good serve and so should be able to put pressure on their opponents. Manson is playing the Harrovian, Sodi who beat Luke Philipson yesterday and Hardy plays the number 2 seed Owen-Browne from Tonbridge. Owen-Browne is quite a player who hits the ball hard for an U15. These are quarter-final matches this morning and there is the possibility of semi-finals later today if either boy is victorious. Sadly our last player in the Incledon-Webber was knocked out yesterday when Harry Thistlethwayte lost. In the Renny we have Luke Pitman and Salil Navapurkar playing later today. George Nixon was really unfortunate yesterday and I felt for him. He has picked up a nasty cold and so was coughing and spluttering in the car on the way up. He probably had three games of play in him but unfortunately after playing well to take a 2-0 lead, his energy levels started to drop and mistakes crept in. His opponent Cawston has proved a dangerous competitor in the past, and he looked more confident as the match went on. Cawston is a good player when he just plays conventional rackets and his serve looked more potent in every game. George just ran out of energy yesterday so in spite of his best efforts he wasn’t able to get back into the match once the third game had slipped by. He has improved massively this term and it was a shame he wasn’t able to show it yesterday. But he will in the Doubles next half…..
After all the controversy and adverse publicity that accompanied the previous Public Schools Doubles tournaments in March 2014, it was good to get back to Queens for the Singles events. The Foster Cup field of sixteen featured no less than five Eton boys, including last year’s winner Toni Morales and number two seed Charlie Braham. For this correspondent at least, it was also good to see schoolboy rackets players involved who are not lucky enough to attend one of the 14 schools with their own court. The furthest traveller this year came not from Manchester, England but from Chicago, Illinois, accompanied by his coach, Will Hopton OE. The Jim Dear Cup is named after one of Peter Brake’s predecessors as Eton Rackets professional and is for U15 and U14 players. The feeling at the start of the week was that this was an open tournament with several possible winners. In the end, the top seed from Marlborough, Dom Coulson, won a close final coming from behind, showing as earlier in the competition his ability to keep his head and remain focused for every point. Notable Eton performances in this competition included Josh Britton who reached the quarterfinal stage with three good wins. Hugo Giddins and Bertie Duncan both put up encouraging performances when they came up against the better players and all three should be pleased with what they achieved this week. The Incledon-Webber event for U16 players was won by Alex Engstrom (St Pauls) as he reversed the result in last year’s final overcoming Ben Cawston. I was encouraged by Salil Navarpurkar‘s performances and as a late-comer to the sport and after just one term of practice, he showed himself one to watch for the future. Tom Loup was never really at his best this week and went out in disappointing fashion at the quarterfinal stage against an opponent he should have beaten. Hector Hardman played much better all week and has improved a great deal this term but lost his nerve somewhat when in a winning position in the quarterfinal against a dangerous opponent. Often players have to go through a match like this at some stage in their rackets career and I know Hector will emerge stronger next time. The courts at Queens put a premium on the ability of the players to move well, to not plant their feet too early and yet to keep taking the ball early and volley in rallies. Hector did all of this well in every round and indeed for the first part of his quarterfinal but as tension creeps in, it is easy for this to ebb away. As the match descended into longer rallies, the better movement of his opponent, Cawston around the court allowed him to gain the edge. The Renny Cup is for U18 players. Jamie Jordache (Harrow) won the final against a good player from Cheltenham in three close games. All the Eton boys in this event performed with credit. Max Cooper made his debut at Queens and played well. Sam White too showed how much he has improved in a high quality match against a good opponent from Marlborough. And it was good to see Milo Dundas smiling after two good wins on the first day of competition. Ed Kandel lost in a close game to the eventual winner and should be encouraged for a strong challenge at this title next year. The main event is the Foster Cup for the sixteen best U18 players in the country. For Eton to have five boys in this event is an impressive achievement but a strong case could be made for us having the four best players and that has never happened for any school in my time in the sport. Ed Rowell was unlucky to draw Braham in the first round but produced a fine display of singles and pushed Braham to the limit in every game. Rowell has worked hard on his backhand side, straightened the ball well and too a good length especially with his return of serve on the forehand side, and although he lost 0-3 to Braham, he came away from this match with tremendous credit in my eyes: an impressive performance. George Nixon lost in the first round to the eventual semi-finalist Maxim Smith (Wellington) and perhaps wasn’t quite able to produce his best play due to a lack of preparation time because of injury. Rory Giddins was seeded three and duly disposed of his two early opponents without really breaking sweat. Rory’s strong serving from both sides resulted in a string of aces and although he could not challenge Morales who was on top form in the semi-final, Rory should be pleased with his week’s work. He will be back next year for another challenge for this prestigious title but will need to maximise all aspects of his preparation to be successful. So the 2014 Foster Cup final was the match most people had been anticipating: defending champion Toni Morales against his first pair partner Charlie Braham. Morales won the first game playing the kind of high quality rackets that had seen him overcome Giddins the day before. He was returning serve very well indeed, killing the ball to a good length off the front wall and dominating the front of the court in rallies. I think is fair to say that of the sixteen entrants in the event, only Morales at the moment can produce play of this quality. He won the first game 15/5 but the question was simple: could he keep it going? In the second game his movement was starting to look less confident and this meant he was unable to hit the ball exactly where he wanted. Balls that in previous rounds were hitting the front wall were now just catching the side wall and so ending up in the middle of the court. Braham was moving well, serving consistently on both sides and the longer rallies were to his advantage. You could see the belief growing in Braham’s body language as he was able to win some crucial points. The rallies were becoming longer as both players struggled to control the length they were hitting and balls were flying off the back wall. Tension affects footwork, which affects the timing of contact on the ball, which causes errors, which causes tension. Who was going to be able to break this cycle? Braham was able to close out the second and third games 15/11, 15/11 to take a two games to one lead. The fourth game was equally close and there were moments in it where a Morales come back looked likely. After a period of scrappy play, Morales would suddenly produce two or three fine points. But Braham was able to keep his belief, to keep serving well and to keep his standards high throughout. Braham won a close fourth game 15/12 to take the Foster Cup title by three games to one. There are just one or two final things to add about this final other than to congratulate Charlie Braham on a fabulous victory. The match was played in a great spirit of friendly competition. You will hear plenty of sports coaches who would suggest this phrase is an oxymoron. They will tell you that competition is never friendly as it is a substitute for some kind of life or death battle. Well I am afraid they are wrong. Morales wanted to defend his Foster Cup title with every ounce of will in his body. But this did not stop him again, as last year, calling balls he had hit not up. There are ways of winning and losing that reveal character and gain you credit and both boys come out of this final even higher in many people’s estimations. I hope that we will see a photograph of a similar hug in March as they successfully defend their Doubles title together. But my final comment is to draw your attention to how hard Charlie Braham has worked and some of the sacrifices he has made to reach the standard needed to beat Morales. 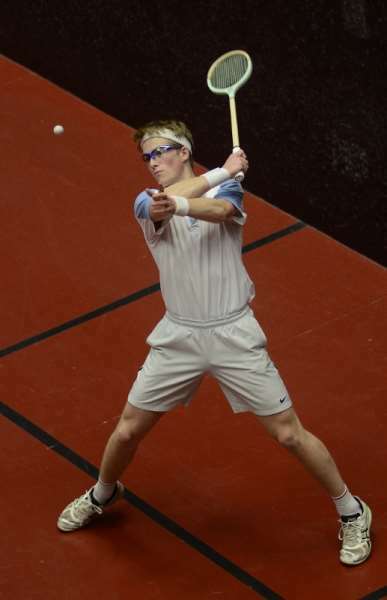 Charlie won the National U18 real tennis title in August this year but has hardly played since as he has been so focussed on his Rackets. He was worked on his strength and conditioning with regular sessions through the term and hard training in between. Perhaps the fitness he demonstrated in the final few points of the final game were the result of all this hard work, this effort over an extended period, this self-motivation…? Perhaps the difference between hitting the last ball up at the end of a 90 minute match and just catching the tin was not due to work on the rackets court but work done, alone, in a S&C suite at school at the end of a long tiring day? My question for the younger Etonians reading this is whether they will be prepared to put this much effort into their preparation, to devote this much focus and determination to be the very best they can be. Do you have what it takes to be the next Eton boy to win this title? I posted a tweet on the eve of the final that presumably is an advertising slogan for a sports brand. But it does seem quite apt: “Don’t Wish for it, Work for it”: a good catch phrase for Eton Rackets in 2015. Today was a busy one with four rackets matches involving Eton pairs on at Queens Club in London. Eton (Tom Loup mi and Ben Brooks) played St Pauls (seeded one) in the first final this morning. The St Pauls pair are very strong and PAB and I both knew that we would have to play at our very best to be able to compete. As it turned out, St Pauls started the match serving very powerfully and to a good length. We couldn’t return enough serves to get into any kind of rhythm and so the early exchanges all went in their favour. Any nerves they might have had as favourites were quickly dissipated as they won the first game to love. The remaining two games were much more closely contested but the reality of this match was that we were outplayed throughout by a better pair. St Pauls won the final by three games to love, 15/0, 15/9, 15/7. Tom Loup and Ben Brooks have had a good week overall and have shown that they can play well as a pair. Both have improved through the week and the boys were disappointed that the quality of opposition was too strong for them on this occasion. We know now exactly how much we need to improve to be able to take these boys on and I look forward to seeing how these two and our other E block players rise to the challenge in D block. Eton’s Colts pair was also an all-RDOC affair. Rory Giddins and George Nixon have been favourites for this competition all season and were seeded one. They reached the final easily enough and had not really been extended or put under pressure before today. Their opponents in the final this morning were the old enemy Harrow whose pair comprised a talented but inexperienced left hander and a hard-hitting and more experienced player on the right side of the court. Eton started well and were made to work really hard in the first game. Harrow actually took an early lead and had several serves with 12 points already accumulated. The Harrow boys were fired up and we had to keep our cool and focus to win this game. As the match went on, the boys became more comfortable and Harrow’s mistakes made it hard for them to stay in the rallies. Nixon served well at times and Giddins played his usual high quality consistent game. More and more unforced errors were creeping into our opponents’ play and we were able to exert some control from in the service box when we served to a good length. 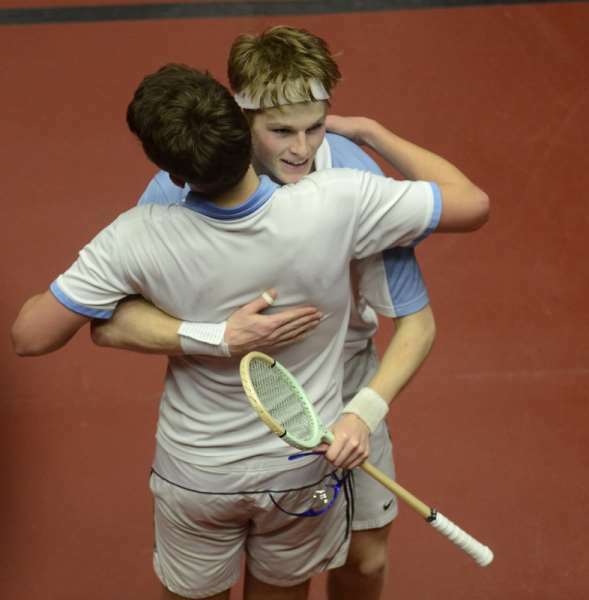 The Eton pair won the match and the Colts Doubles trophy by four games to love 15/12, 15/8, 15/4, 15/6. Well done to Rory and George for winning Eton’s first trophy of the week! Second pairs semifinal Eton (George Loup and Ed Rowell) won well to reach tomorrow’s final. They beat a good Harrow 3rd pair by four games to love 15/10, 15/3, 15/10, 17/16. It was good to see a collection of beaks and boys at Queens today to support the team. Thank you to everyone who made the effort to come into London to see the boys play. Do please come along tomorrow for the two remaining finals if you are free. Both are Eton-Harrow clashes of course and the galleries tend to be packed on these occasions so get there early to make sure you have a good view. Today was the day we all had a chance to say celebrate the life of Sir Mervyn Dunnington-Jefferson at his wonderfully moving memorial service at St Luke’s Chelsea. The church was packed (600 approx) which was in now way a surprise nor was the fact that OER&TC, IZ and Ramblers ties were all much in evidence. I only knew Merv for the last 15 years or so and so it was great to hear stories in the address about his life as a young man. The music from the choir was truly exceptional I thought with two beautifully sung solos in two of the anthems. Merv’s son read a poem called “The Eighth at Brancaster” most apt of course as this is where Merv played his golf. Merv always struck me as a man who could squeeze every last drop of enjoyment and fun from any experience. He was a true supporter of Eton Rackets, always keen to hear how the boys were doing and generous with helping us financially with tours and prizes for boys. For many years, and in spite of all my advice, he would place a bet on the Eton runner in the Foster Cup at Queens. I don’t think he ever won. The one year in which we won, when Merv could have got some of his money back off David Makey, was the year of Will Hopton’s success and Merv inexplicably decided not to make his usual mistake and instead backed the top seed and favourite, who we beat in the final. I loved talking to Merv about horses. I used to bump into him frequently at York for the Ebor meeting in August and Merv would regale me with his tales of woe about the 2 year olds he had in training with Paul Cole. Each one was a disaster, never fulfilling potential or breeding promise, but Merv’s grumblings about his horses were always delivered with a twinkle in his eye. Merv loved the competition, he loved the stories and characters in racing and clearly loved York. I will miss him massively in the summer when the flat season starts once again. For the past 10 years or so, Merv used to come to Eton just before Christmas with his great friend Dudley MacDonald to play rackets. Peter Brake and I would play what came to be known as the “Christmas Doubles” on what was always a cold Monday morning with Merv and Dudley. The knock ups and match usually lasted 45 minutes or so in total with many expletives and profanities uttered by Merv through the game. We would then adjourn to Gilbey’s on the High Street for a lunch that normally took three or more hours. Having worked our way through some of the wine list, always chatting about rackets, cricket or the horses, in conversations accompanied by raucous laughter, I would stagger home up the road and usually crash out on the sofa. Merv would drive back into London for a drinks party in the evening. It was clear from the service today that Merv was clearly a beloved friend to many and I am sure that all 600 of the congregation could tell similar stories of happy times in his company. The last few months of his life were sadly blighted by illness but prior to that Merv had lived his life to the full. His service reminded me today that our time is limited, that family is the most important thing and that every day gives us the chance to laugh, to enjoy time with our friends and to have fun. Merv I never got a chance to say any of this to you in person and you would certainly not have found this on Twitter. But I valued the kindness and friendship you showed me more than you could know and I miss you. RIP.